Interview conducted summer of 2000. In John Cullen Murphy’s own words, “I never had an ambition to be a comic strip artist.” This from a man who’s been awarded the silver plaque for Best Story Strip by the National Cartoonists Society a record six times. 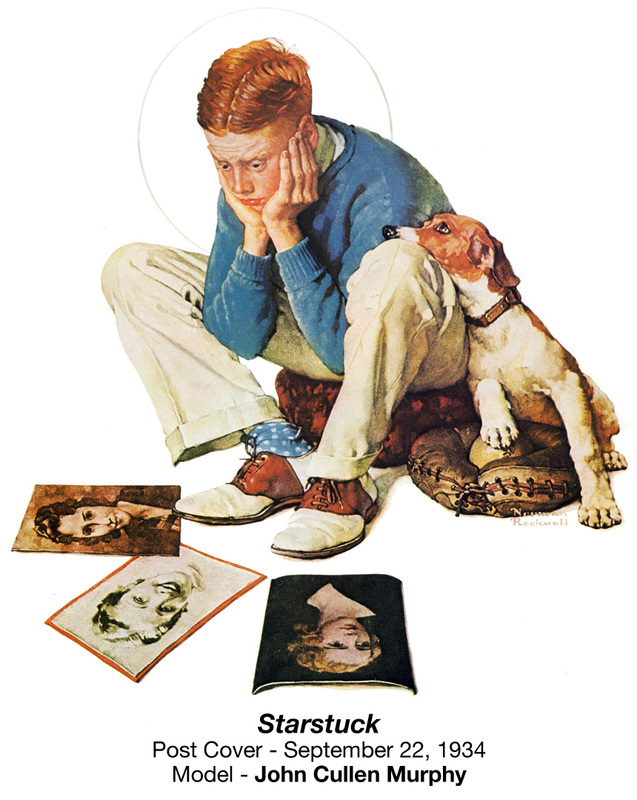 Taught the fundamentals of illustration by such legendary artists as Norman Rockwell, George Bridgman and Franklin Booth, Murphy became a prolific illustrator. 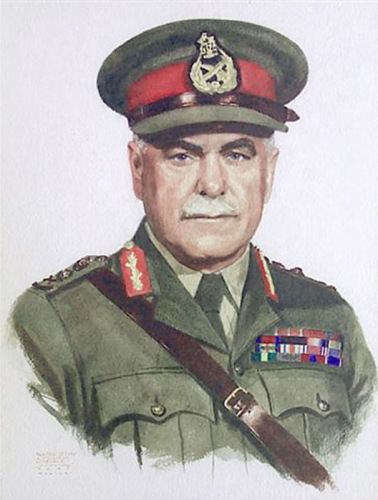 His work in the forties ranged from portraits of military figures, including General Douglas MacArthur, to magazine illustration for such well known periodicals as Collier’s and Esquire. When approached to do a comic strip, having determined that the market for magazine illustration was shrinking, he decided to take the plunge. 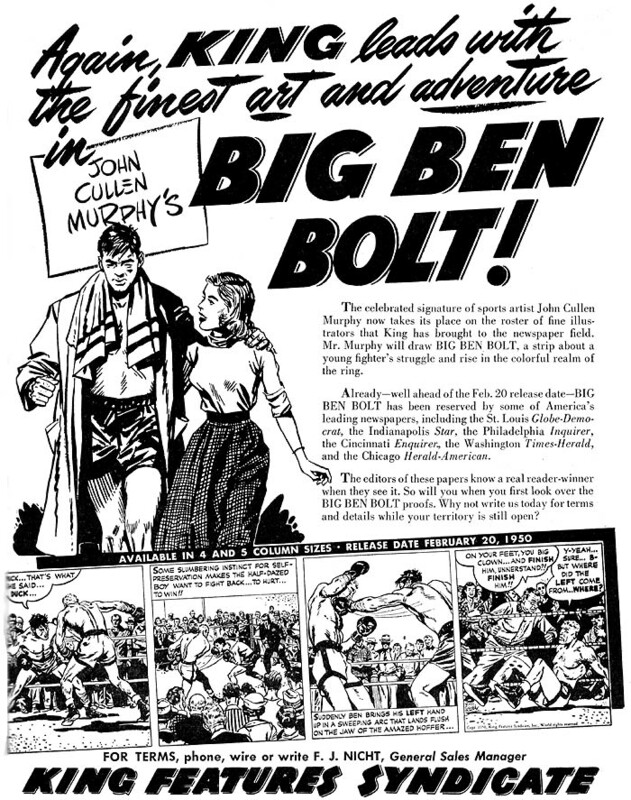 Murphy would illustrate the exploits of boxer Big Ben Bolt for King Features, in addition to his magazine work, for the next 20 years. 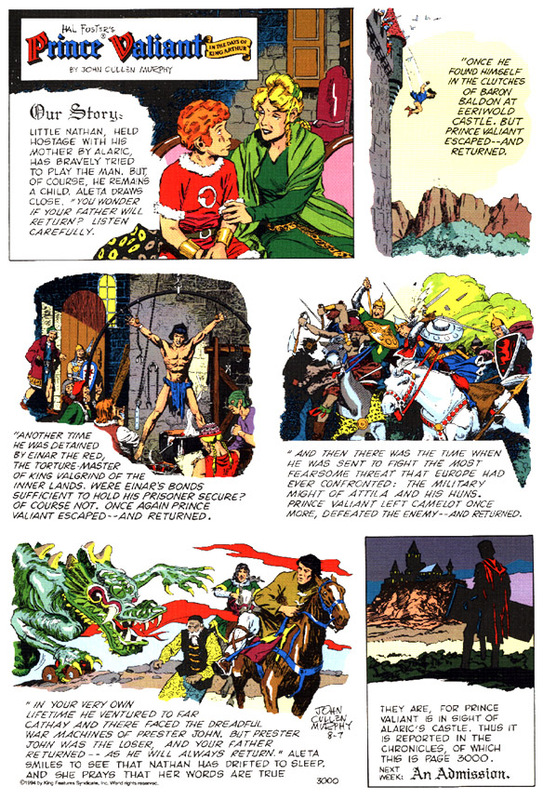 Then, in 1970, Hal Foster began looking for someone to take over illustrating Prince Valiant. Three artists were considered – John Cullen Murphy was selected. One of the most successful story strips in syndication, the year 2000 (when this interview was conducted) marked the thirtieth year of Murphy’s tenure on the strip. In a field pervasively distinguished by gag-a-day strips drawn with felt tip pens, John Cullen Murphy’s lush illustration harkens back to a golden age of comic strip art. Jim Keefe: I understand that at age nine you studied at the Chicago Art Institute. What were the classes like? John Cullen Murphy: They were Saturday morning classes for kids. The Chicago Art Institute is a great museum, and down in the cellar they had classes for students. They had us working from models and plaster casts and all that. I’d take the ‘L’ in each Saturday with my Father and come back on my own. You could do that in big cities in those days. JK: I take it your parents were supportive. John Cullen Murphy: Oh sure. They knew a lot of artists. My Father was in book publishing with Doubleday so he knew a lot of writers and artists. JK: What artists inspired you at that age? John Cullen Murphy: Gee, I can’t remember. I wanted to be a baseball player. JK: So you kinda got sidetracked a bit. John Cullen Murphy: I was drawing ever since I can remember, my parents encouraged me. I don’t recall any favorite artists, I probably didn’t know enough at the time. JK: Were you interested in comic strips or comic books back then? John Cullen Murphy: No, never. I never envisioned going into comic books or strips at that time. I wanted to be a sports cartoonist. I did do a lot of sports work later on, but I never had an ambition to be a comic strip artist. Magazine illustration is what I did and enjoyed. Back then they had a lot of magazines with fiction stories that were popular. I think TV later broke the back of general interest magazines. Of course, specialty magazines are very much in now. JK: As far as magazine illustrators, I heard that as a teenager you modeled for Norman Rockwell. John Cullen Murphy: That’s after we moved east. we moved into New Rochelle where he lived at that time. He saw me playing ball one summer and came across and asked me to pose for him for a cover, so I did. I posed another time for a mural he did. JK: What kind of influence did Rockwell have on your career? John Cullen Murphy: Oh, great. Great because he was very interested, I was doing a lot of drawings then and he was of great encouragement to me. He was instrumental in getting me a scholarship to an art school in New York City after I graduated from High School, the Phoenix Art Institute which is now a part of Pratt. And when I went to the Art Student League he told me to study with George Bridgman for anatomy, the same teacher that he had. It was then that I took up painting for the first time. I use to do illustrations where Rockwell would give me a story to do. He gave me a short story by Hemingway and I had to do illustrations for it. I would bring in each stage. First a rough sketch, then a composition sketch, a color sketch and then to the big finish. And at each stage I would bring it in and show him and he’d criticize it. So it was like he was being another teacher. JK: I understand you also studied under Franklin Booth? John Cullen Murphy: That was at the Phoenix Art Institute. Another wonderful man. A very kindly, elderly gentleman. Probably in his sixties at that time. I thought that was pretty old, but he was a very nice man. A great technician. Walter Beach Humphrey was another Saturday Evening Post cover artist I studied with. Also Charles Chapman who was a great painter. JK: This was all at the Phoenix Art Institute? John Cullen Murphy: And the Art Students League. I’d go to the Phoenix Art Institute in the morning then walk down to the Art Students League in the afternoon. JK: How old were you when you first started getting illustration work? John Cullen Murphy: At seventeen, doing sports cartoons for Madison Square Garden. They’d use them as publicity for upcoming fights. That was the first work I sold. Then there was a weekly magazine out in Chicago that was nothing but sports cartoons covering events of the past week. I use to have one or two of those every week when I was still in High School. JK: In 1941 at age 22 you joined the army. Where were you stationed? John Cullen Murphy: In 1940 I was in the National Guard, the 7th Infantry Regiment in New York City. We kept waiting month to month to be called into federal service which finally happened in February of ’41. I went down to Camp Stewart, which is now Fort Stewart, near Savannah, and I was down there until Pearl Harbor day. I had a cover that I did for Liberty magazine come out when I was down there. JK: Were you able to keep drawing while in the service? John Cullen Murphy: Oh yeah, I use to do heads of the guys, portrait heads, for a dollar a piece. Then I went to Officer’s candidate school in ’42, then out to California, then from there I went on to the South Pacific. I did a lot of portraits of people out there. I did General MacArthur and his wife and son, an Australian field marshal, a lot of high ranking guys. Then I did a lot of on the spot sketches that were printed in the Chicago Tribune for their Sunday supplement. by John Cullen Murphy – circa 1945. JK: How do you go from being out in the Pacific doing sketches to being published in the Chicago Tribune? John Cullen Murphy: I was just making sketches all the time and I met a war correspondent from the Tribune. He said, “Hey, send them back to my paper.” So I did. JK: Once the war was over, were you able to get back into the job market where you left off? John Cullen Murphy: Oh yeah. The first day I went around I was still in uniform. I was on terminal leave and decided to keep my uniform on, I didn’t have any other clothes. I went around and I got a bunch of jobs the first day I went in. I did a lot of stuff for Metro-Goldwyn-Mayer. Portraits of Van Johnson and Sinatra and all those people for publicity for the movies. And I did work for Look magazine. JK: It sounds like you were real prolific as far as how much work you were getting. JK: How did the comic strip Big Ben Bolt come about? John Cullen Murphy: Every week I would have a water color painting in some sports thing in Collier’s magazine. 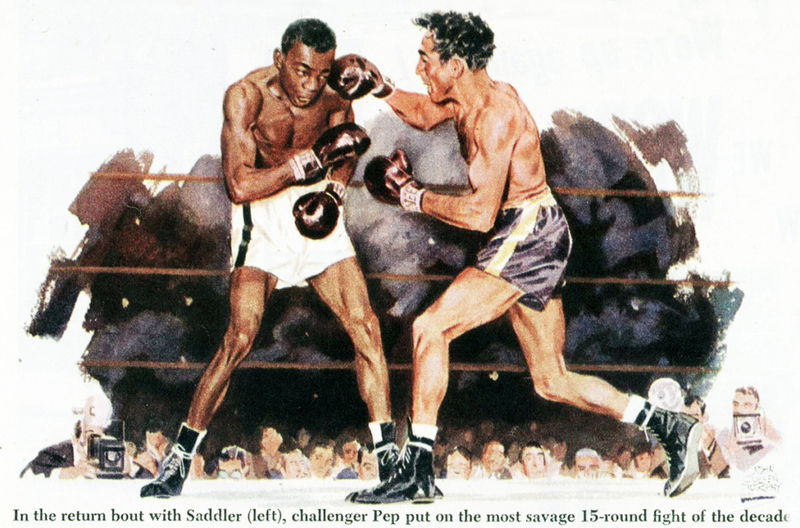 This particular one was a prizefight scene when Willie Pep was fighting Sandy Saddler for the featherweight championship. 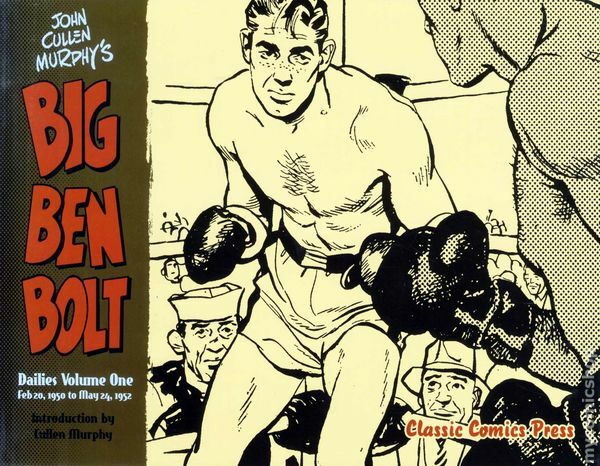 Elliot Caplin, who was the brother of Al Capp, saw it and he called up my agent and wanted to know if I’d be interested in collaborating on a boxing comic strip. After mulling it over I conceded illustration was fazing out from what we had during the golden age so I thought this would be a nice way to have some steady income. I did two weeks of samples of Big Ben Bolt and Elliot took them to King Features and old man Hearst himself bought it. I had never contemplated doing a comic strip until that. Big Ben Bolt promo piece. JK: You said that some of the first illustrations you had sold were for boxing matches so it kind of came full circle then. John Cullen Murphy: I got to be a real expert on boxing. Though it’s not much of a sport anymore, where you have three champions for every division. It’s a mess. At the same time I was still doing magazine work. Doing covers for Collier’s, for Sport Magazine, Holiday, Bluebook. I had about six double page spreads in Esquire. Sports things. Jim Keefe: How did you balance doing a full weeks worth of strips, Sundays and dailies, with your magazine work? John Cullen Murphy: I worked hard. (laughs) I didn’t want to give up the magazine work right away. JK: Did you have a studio in the house? JK: Now this is of particular interest to me as someone who works out of the home. In ’51 you started raising a family, you got married – how did you get your work routine worked out? John Cullen Murphy: Well, I didn’t have any children before I was married…which would be pretty unusual today I guess. (laughs) But anyway – I had a large apartment in New Rochelle and took the biggest room and made it my studio. That’s the most important room outside of the nursery. Then we moved up to Connecticut and bought a house that had more room. A big old Victorian house and I used the whole third floor. Then we had a lot of children and I built a studio in the backyard. JK: How do you schedule your time? Is it a discipline of say, getting out to the studio by nine? John Cullen Murphy: Sometimes seven, nine would be kind of a late start. And of course nights too. JK: Nights seem to be the quiet time. Everyone’s sleeping and no interruptions. John Cullen Murphy: And no telephones. JK: No pun intended, but I take it the family got drawn in to help with reference? John Cullen Murphy: Oh yeah. I have voluminous files my wife, Joan, use to help me out with. We married in ’51. She use to pose for me a lot, then the kids would pose later on. 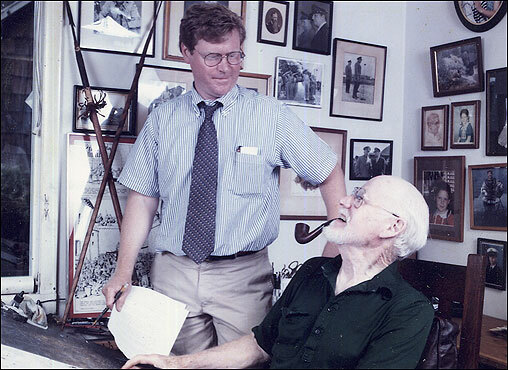 When my first, my oldest son Cullen, was just out of college he use to give story ideas and outlines to Hal Foster. So Hal always liked him. 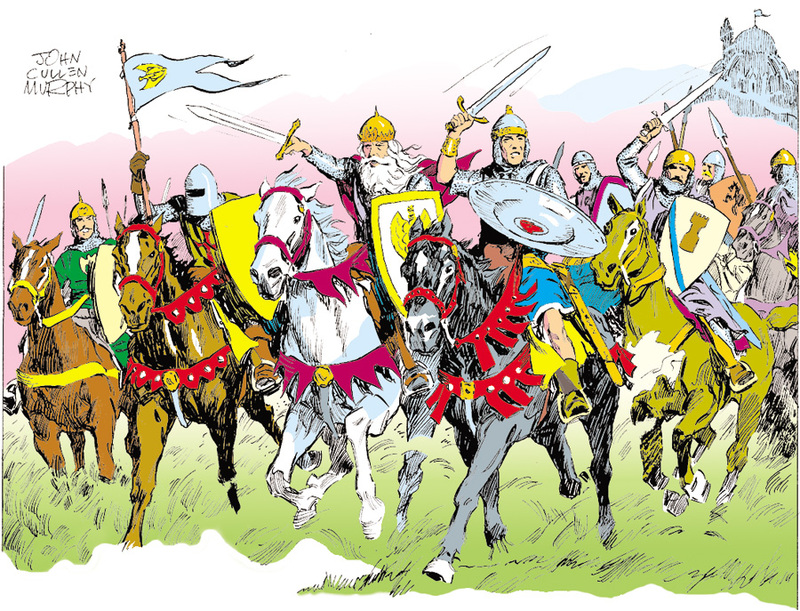 He’s writing Prince Valiant now and has been for almost twenty years. Cullen Murphy (writer) and John Cullen Murphy (artist). JK: Did the writing go from Hal Foster to your son? 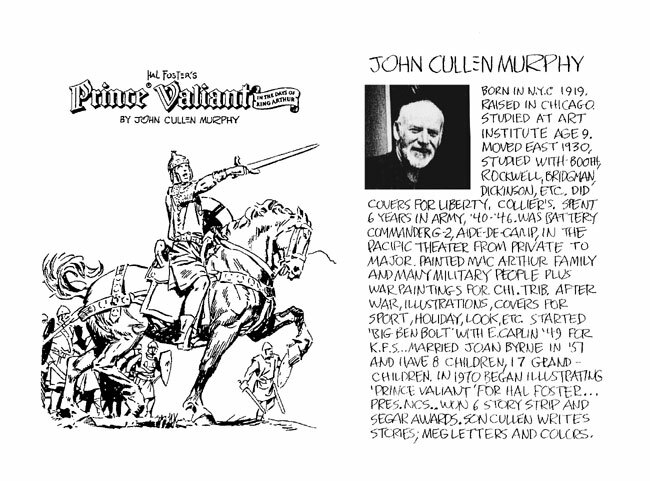 John Cullen Murphy: Yup, In fact when he sold Prince Valiant to King Features he recommended that I be retained as the artist and my son be retained as the writer. That was when he was down in Florida and retired. JK: You started doing Prince Valiant in 1970. Now Big Ben Bolt ran until 1975. Did you end up dropping that? John Cullen Murphy: Yeah. I would do an occasional Sunday page or something like that, but I wasn’t drawing it at all the last few years. A bunch of different guys did it. There was a lack of interest in boxing by that time. We started out and were very good for a number of years and then the interest kind of petered out. JK: How did Hal Foster go about picking someone to take over illustrating his strip? Did he approach you? John Cullen Murphy: There was two or three guys, Wally Wood was one, but I had gone to him in ’68. I wanted to broaden my income and thought he might be wanting help. At that time he didn’t. I had brought a lot of my work and showed him and then two years later he called me up and asked me to come up and see him. I started doing it and never stopped. JK: What was the work routine like between you and Foster? Was he still living in Connecticut then or was he in Florida? John Cullen Murphy: He was in Connecticut, about forty-five minutes from here. West Redding, Connecticut. He had a beautiful place there, several acres out in the country. He would give me the script and make little thumbnail pencil sketches, you know, ideas for composition, and I’d take them home and bring them back up to him the next week. Then after about a year of that he moved down to Florida and we did everything by mail. Talked a lot over the phone. JK: It was a good working relationship then? John Cullen Murphy: Oh yeah. He was like another Father to me. Great guy. A lovely wife too. But they’re both gone. JK: He passed away in ’82? John Cullen Murphy: Yeah. He would have been ninety in another week or two. JK: Then he passed away just a couple years after he stopped scripting it. John Cullen Murphy: Yeah, that’s right. I kept in touch with him all the time, but he wasn’t well. I think he had an artificial hip put in. JK: You mentioned he sold the ownership. Was it hard for him to give up the strip? John Cullen Murphy: Sure,because it was his baby, his creation. JK: I understand he initially had it plotted out until Prince Valiant’s death. John Cullen Murphy: He wasn’t sure if he wanted it to continue on after he died or retired, and he was going to have one big Armageddon where everyone would come in and get killed, but then he took pity on me and kept it going for my sake. JK: Very nice of him. John Cullen Murphy: Well, I’m a nice guy. JK: (laughs) When I saw you up at the tribute they had for you at the NCS function in Connecticut last November, you had your son there who writes the strip and your daughter who letters and colors it. You mentioned your son took over the writing after Foster. Has your daughter Meg been lettering and coloring since then also? 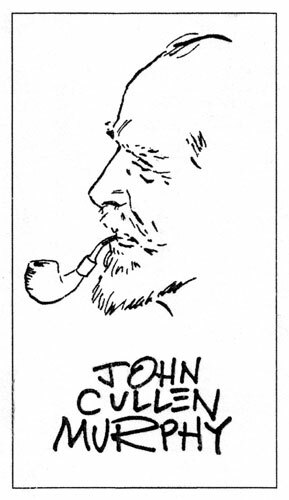 John Cullen Murphy: No, in fact for a while I did the lettering myself. Ben Oda did the lettering at first and then he died. Remember him from King Features? He was very well known down at the syndicate, if there’s anybody left there. John Cullen Murphy: No, he was gone by then, long gone. JK: One of the nice things about when I worked on staff was seeing full size artwork when it came in. I especially remember those big panels you’d occasionally do. John Cullen Murphy: Y’know, years ago, people use to go into that storeroom there and walk out with the stuff. I was never in that place in my life to tell you the truth. JK: Well, they’re much better about storing things now. The only reason they have all the old Flash Gordon proofs from the thirties is because they bought them from the Raymond estate. John Cullen Murphy: To me that was his peak period, those earlier things. Marvelous. John Cullen Murphy: Well, he had a couple guys for a few weeks I guess, and then I took over the whole thing. JK: It’s been thirty years now, right? John Cullen Murphy: In August. JK: Was there any initial pressure when you first started? John Cullen Murphy: Nah, I was very confident. I was almost fifty years old at the time. I had been in this business ever since I can remember and I knew Hal personally for years before. JK: It seems like the comic strip illustrators of your generation tended to come from magazine illustration and formal training, where they don’t as much today. John Cullen Murphy: Yeah, like Briggs and all that. Alex Raymond’s younger brother was my assistant for fifteen years. So I knew all the Raymonds very well. JK: Which brother was that? JK: And then Jim Raymond did Blondie, right? So the whole family did comic strips or..? John Cullen Murphy: No, they were the only other two. George began as my assistant after I started Ben Bolt. He did all the lettering, laid things out for me and did research. 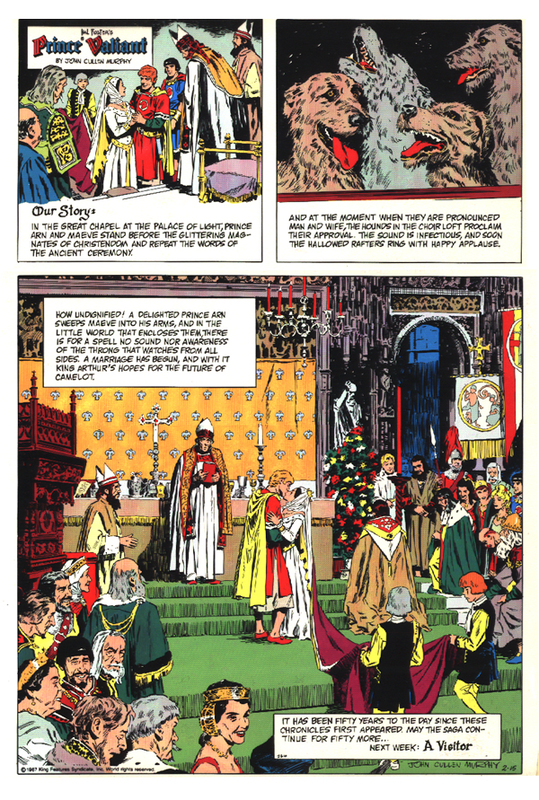 JK: On a strip like Prince Valiant where you have all the historical aspects and settings, how much time goes into research and reference? John Cullen Murphy: I couldn’t tell you. I have lots of stuff right here, books and things, Hal gave me a pile of books. But there’s not much research on that, nobody knows anything about that period. It’s just a bunch of barbarians, unless they were kings or something, they pretty much dressed the same. We take a lot of liberties with it. We have elaborate palaces and castles. This was the time of the barbarians, right after the fall of the Roman Empire. Instead of being enormous marble castles what they really had was probably wooden stockades and that sort of thing. But you want to make it pictorial and interesting looking. JK: You mentioned having an assistant on Ben Bolt, do you have assistants now? John Cullen Murphy: No. The last year or two Frank Bolle had been helping me with lay outs and that sort of thing, but the pen work was all mine. I went over all the drawings. JK: In one of Foster’s last interviews he wrote that you’re a very good illustrator in that you can make the hands talk, that they confirm the expression on the face. What do you see as the points that make up a strong illustration? John Cullen Murphy: Light is very important. You’re like a stage designer and you want to have it as powerful as you can, so you have big strong blacks and such. But it’s a combination of drawing and composition and lighting. JK: Do you do much painting these days? John Cullen Murphy: I painted today. I do oil paintings, portraits and things. JK: Do you still do freelance in addition to Prince Valiant? John Cullen Murphy: No. What I do is for myself or for my 8 kids or their children, my 16 grandchildren. I use to do these big oil paintings, these big chairman of the board things and all that. JK: I’m going over my notes and there’s Norman Rockwell, Booth, Foster. You just run the gamut here. John Cullen Murphy: I use to go to the Art Student’s League one night a week and I’d paint portraits under a great portrait painter named Sidney Dickinson. I don’t know if you’d remember the name. I was very fortunate in my mentors. This entry was posted in Artist Spotlight, John Cullen Murphy, King Features. Bookmark the permalink.